In mid-July, the Chinese city of Yumen in the northwestern province of Gansu sealed itself off and placed 151 people in quarantine after a man was exposed to a Himalayan marmot and died of the pneumonic plague. Official media reported that the city’s 30,000 residents have not been allowed to leave, with police setting up roadblocks and laying down tire-piercing spikes along the main roads leading to the center of the town. The death of a resident from the plague itself is not unusual or unexpected. After all, plague is enzootic in Gansu. It is also legal for the province to order the lockdown of the city—China’s Law on the Prevention and Control of Infectious Disease allows provincial governments to seal off infection zones in their jurisdictions affected by plague. Due to the rather high mortality rate of a pneumonic plague, it was also understandable for the government to be concerned about the potentially serious public health impact of the disease and the risk of its spread beyond the city. Still, it was a dramatic and draconian move—we cannot recall the last time that any localities invoked a quarantine since the 2003 SARS outbreak, when some Chinese villages locked themselves up voluntarily. But the plague, once responsible for some of the worst blights in human history, is no longer that dangerous. It is 100 percent preventable with small doses of prophylactic tetracycline, basic hygiene, and pest control measures to eliminate infected rats and fleas. It is also not life threatening if diagnosed and treated in time. Moreover, rapid treatment is cheap, effective, and generally without side effects. Internationally, it is extremely unusual to seal off a city for one plague case. A few exceptions include the San Francisco plague from 1900 to 1904, when the entire Chinatown area was quarantined, although the measures ultimately failed to contain the spread of the plague. Today, five to ten human cases are typically reported each year in the United States, with about 10 percent overall case-fatality rate. Yet we haven’t come across any state that has chosen to lock down a town where such cases were identified. 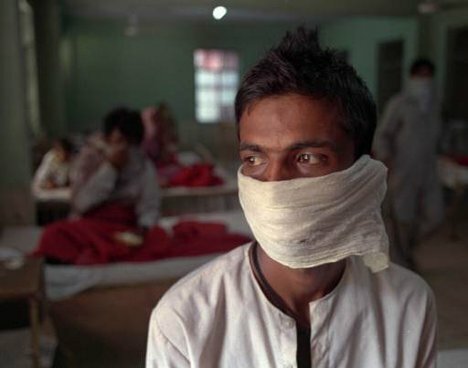 In 1994, a bubonic plague broke out in a rural district of Maharashtra in India, spread by fleas. Because human cases went untreated, a few people developed the pneumonic, respiratory form of the disease, which can be transmitted from person to person. A few of them traveled to nearby Surat, a densely populated city, where plague spread. Panic followed, and most of the population fled Surat, leaving a tiny group of health workers to tend to ailing patients and putting the entire nation of India into a fearful, rumor-mongering state. The fear of plague was inappropriate, as the Y. pestis bacteria were fully vulnerable to cheap, readily available antibiotics. As Garrett described in her 2000 book Betrayal of Trust, the government reacted to plague as if it were still the scourge of the European Dark Ages, and the Indian economy suffered dearly from hastily erected quarantines, shutdowns of air travel, and international avoidances of Indian travel and goods. The epidemic did not come under control until everybody calmed down, rat and flea eradication measures took hold, and appropriate antibiotic prophylaxis and treatment was dispensed. Like India in 1994, China twenty years later seems to have laws on the books and government actions that better reflect the fourteenth century than the twenty-first. The approach of separating the sick from the healthy population can be traced to the fourteenth century during the Black Death plague in Europe. Although crude quarantine measures failed to contain the spread of plague in medieval Europe, they became widely adopted in the following centuries. In the nineteenth and twentieth centuries, however, with the advancement of biomedical technologies and improved sanitation, quarantine was no longer considered the only means to control the spread of a historical disease such as plague. Today, globalization and increased travel and trade have enabled a disease to spread far and fast even before government intervention measures are in place. In the Yumen case, the negative social-economic impact of the decision to seal off the city was tempered by the town’s small size (Yumen has a population of only 30,000), economic unimportance (it is a dying city as oil resources are depleted), and geographic isolation. Chinese local decision-makers need therefore to update their thinking about the infectious disease threats and the strategies aimed at their solution. ‡ This post was coauthored by Laurie Garrett and Yanzhong Huang, both senior fellows for global health at the Council on Foreign Relations. This piece was first posted to CFR’s Asia Unbound Blog on July 30, 2014 and can be found here.